The Rare Books Sector was organized in 1978. 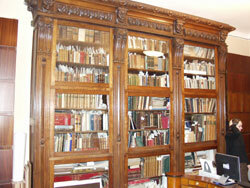 Especially valuable editions are kept in storage and studied in the Sector. The fund consists of books that had been published before 1825, editions illustrated by famous artists, books with prints and lithography, books that are the monuments of polygraph and books with inscriptions of artists and cultural workers. private book collections of cultural workers - A.N.Benois, V.V.Lebedev, E.N.Tevyashov. The number of holdings is about 5000 items in storage of the Rare Books Sector. The work of studying this collection is constantly being carried out in the Library. On-going work on acquisition of new holdings allows us to improve existing collections and create new ones.